After posting about the new Slides’ Q&A feature, we received a couple of questions regarding its usage. So we created this visual guide to walk you through the process of integrating questions in your presentation. 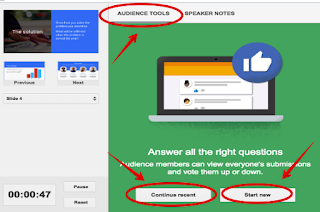 But let us firs start with a refresher about what Slides Q&A is all about.This is a new functionality that allows members of your audience to engage with your presentation by asking realtime questions while you are presenting. They can also vote on the questions they want answered the most. To activate this interactive feature in your presentation you need to generate and share a link with your audience so they can access the page where they can write down their questions. Once a member asks a question, it will show up in the ‘Audience Tools’ section accessible through Presentation view. Clicking on the ‘Present’ button under any question will display the question to the whole audience. Here is how to start a live Q&A session during a presentation with Google Slides. These instructions below are for computer users, for Android and iPad users check out this page. 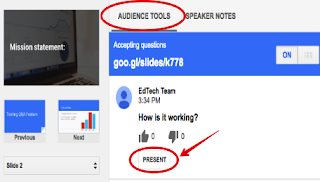 ‘Open a presentation in Google Slides. 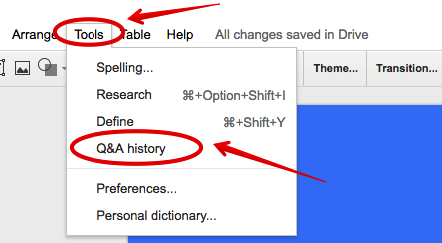 At the top, next to "Present," click the Down arrow. In the new window, click Audience tools. To start a new session, click Start new. To resume a recent session, click Continue recent. 'Under "Audience Tools," find a question you'd like to display. To change the question, find a different question and click Present. 'Open a presentation in Slides. 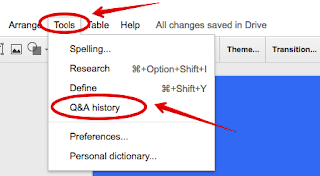 At the top, click Tools Q&A history. 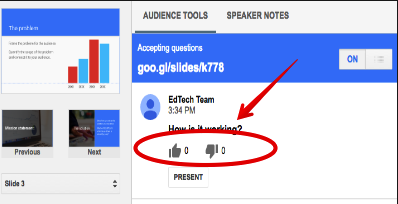 For audience to be able to ask questions they need to click on the generated link shown on the top of the presentation. 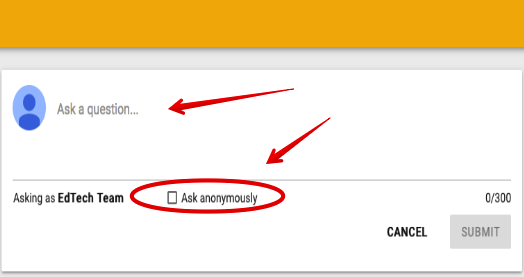 Next, they click on ‘ Ask a question’ and type in their question. They can choose to ask an anonymous question if they want by clicking on ‘Ask anonymously’. When done, they click on ‘Submit’. Go to the Q&A link shown on the slide. Below the question you'd like to vote on, click or .